Happy Memorial Day and thank you to the men and women and families who sacrifice to defend our country. God bless you all! 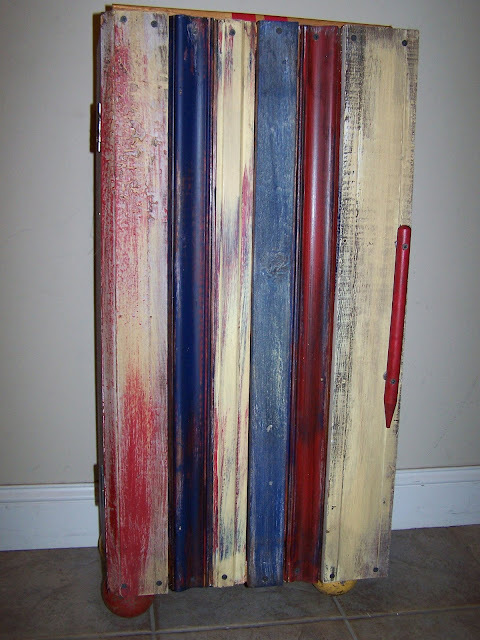 PS--A couple patriotic picket fence projects. Today is a very rainy day. It was 87 yesterday--today 44. 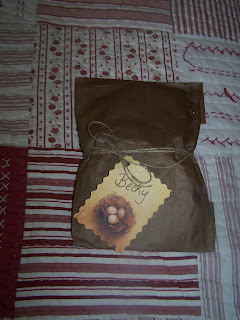 No painting today, but it was a good day to nest and bake. 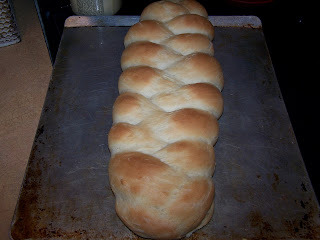 This bread isn't junk, that is for sure, but it is quick and easy, great for a busy junker! You need a kitchen aid or a mixer with a dough hook. Makes you feel good, baking for your family. Kneed 4 minutes with the dough hook, adding 1-2 cups more flour. Let rest in bowl 10 minutes, covered with a damp towel. Spray pans. 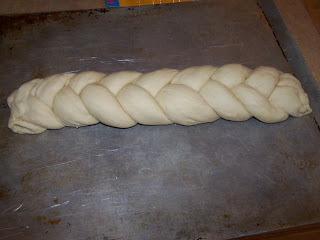 Shape into rolls, 2 loaves of bread, etc. Let rise 20-30 minutes. Bake at 400 for 20-25 minutes. 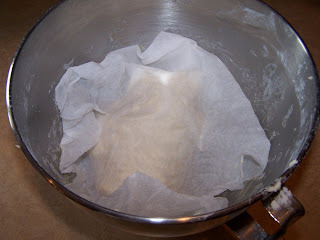 I use this recipe for pizza dough, but I eliminate the egg. 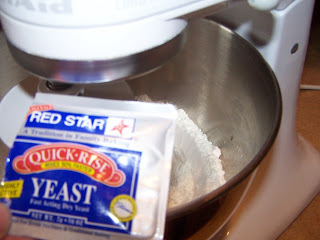 I also use it for cinnamon rolls, but I add hot milk instead of water, and a little more sugar. I've added grated cheese and garlic to it. **I usually make 1/2 of the recipe when I make it just for our family. She is creative and has a sweet and gentle heart. 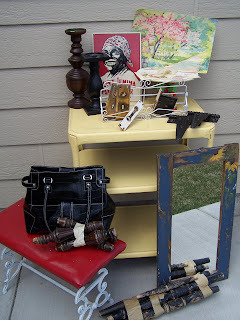 Hopefully I will get back to some junkin' projects tomorrow, except 4 inches of snow is expected-HUMPH!!! Oh the postings have been sparse--so sorry! The brain has been preoccupied, mostly with Kade and all of that, plus car dealings from my wreck. There was some good news on Kade today and he is apparently shocking the nurses and doctors with his progress. He spoke for the first time today. God is good and He is working in Kade and our community. I sold things at a friends community garage sale on Saturday. I managed to buy more than I made Ü. Here are a few of my finds. I got this dresser for $10. It is for my son's room and will be painted black and will get a new set of hardware. The bottom drawers are cedar lined and it is very well made. 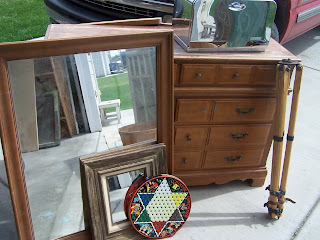 I love the surveyor's tri-pod and my favorite find was the vintage kitchen cupboard with the glass door that was only $15. It does have shelves for the inside--I took them out before I took the picture. 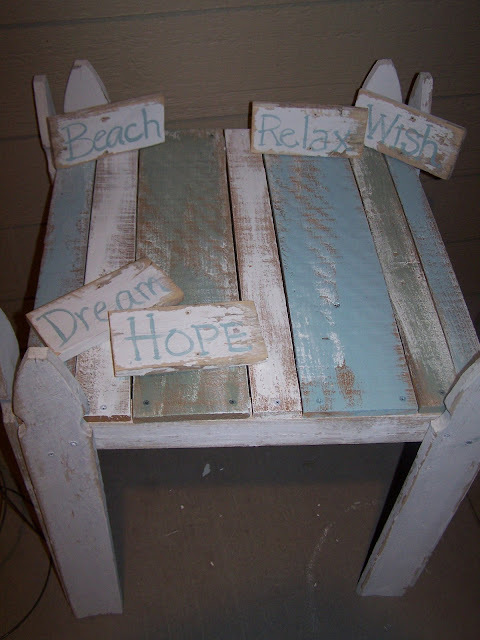 I repainted the inside a fresh coat of white and the outside the ocean, cottagey blue I love so much. I forgot to take pictures of it afterwards--like I said I have been a little scattered. I also loved the vintage Chinese checker set I got--it has all of the pieces. I hope to make it into a table this week with a little twist. I will remember to take pictures, I will remember...And that shiny thing is a vintage bread box in good condition. It has a little rust I need to remove. 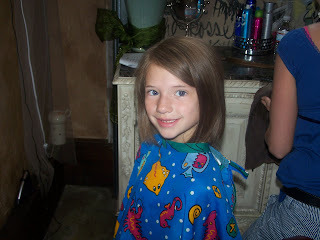 My daughter cut her hair off for "Locks of Love" yesterday. 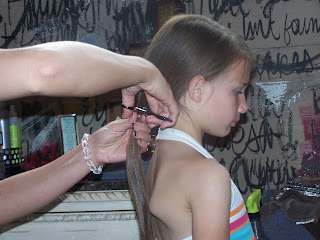 The hairdresser (Shannon) put it on the pony tail and said, "This is going to be short." My daughter started crying. I told her we didn't have to do it--we could wait until it was longer. But she wanted to, so she dried her eyes and went for it. I love the short hairdo and no more tangles to deal with! Thanks for your prayers for Kade. It is not looking very good, but we continue to hope for a miracle. It is hard to see these teenagers go through this. Most of the kids in my son's class and his group of friends have been buddies since kindergarten or before so they are close. He said the school is pulling together and that is good to see. Please continue to pray. You can go to caringbridge.org/visit/kadepage if you want to read more. Thanks again. The rules for this award are: You have to pick 5 blogs that you consider deserve this award for their creativity, design, interesting material, and also contributes to the blogging community, no matter what language. Each award has to have the name of the author and also a link to his/her blog to be visited by everyone. Each award winner has to show the award and put the name and link to the blog that has given her/him the award itself. The award winner and the one who has given the prize have to show the link of “Arte y Pico’ blog, so everyone will know the origin of this award. I will pass the award on in a few days. I think I will wait until I figure out how to post links. Thanks so much Sher and Joy--I am honored. Now for a sort of project. 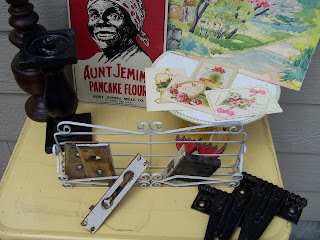 I took out some new things I hadn't shown you to my antique booth today and totally forgot to take pictures. I was a little distracted--managed to break two bowls and a glass at my booth and the shark cordless sweeper that belongs to the antique barn. I bought them a new one. My brain has understandably been scattered. For the project I liked the best that I took out there, you will have to use your imagination so close your eyes and picture the red vinyl covered, white iron little bench I showed a while back on project seven day. Got it? 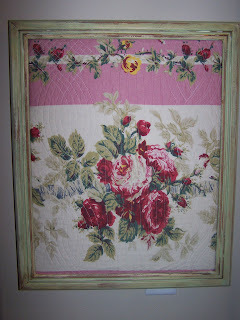 Now picture the rose quilt bulletin board I showed as a quick project. I took that same pillow sham and covered the stool. It was so cute and quick. I also took some more candlesticks like these. Can you guess what the shorter one is made of? It is a pepper grinder. The wood ones from the 70's and 80's are abundant at thrift stores. 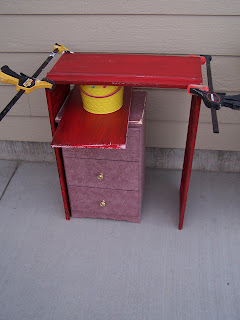 Unscrew the top, take out the metal middle and paint it up and you have a candlestick. The taller candlestick is a brass one that I painted. Just use a little primer first. I did get a call tonight from the antique barn where I have my stuff and one lady came in and bought 5 pieces--a few that had been there from the beginning that I just moved around today. 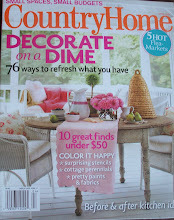 She also bought the bench that you imagined and the matching bulletin board. I promise to post pictures tomorrow. After recovering from the accident, I spent a relaxing Mother's Day with the family. Woke up yesterday morning to the news that my 15 year old son's friend had taken some pain medicine for a surgery that he had on his arm, had a reaction to it and was in critical condition. His mom could not wake him for driver's ed., he was rigid and his teeth were clenched. She had to do CPR on him. I spent the day at the hospital comforting teenagers and his mom (we used to teach together). Last night they life flighted him to Salt Lake. At the time they were saying brain damage, kidney and liver damage with the possible need for transplants. As of today--they are expecting his organs to recover 100%, we are waiting for MRI test results on the brain. He was put in a coma and they have slowly been taking him out of that today. He has responded to voices and is fighting the ventilator, but they have quite a deal of concern about his white brain matter (apparently the connector matter in the brain). Any and all prayers for Kade and his family will be appreciated. We believe prayer has changed the outcome so far and we are continuing to believe for a complete healing. Thus this has been where I have been and why junking has been put on the back burner. I hope you all don't give up on me as I enjoy sharing with you. Hug those babies (yes even those teen aged ones) a little tighter today! 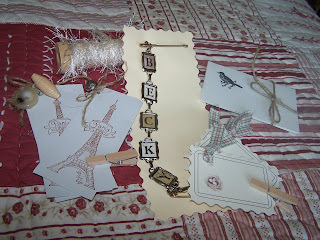 I have some projects to post and I received a lovely blog comment prize from Sondra at Aged Essence that I wanted to share, and I received the same award from two people. All of these things do need attending to and I will do my best to get to them tomorrow. I was in an accident Thursday that, thank you God, was not as serious as it could have been. I was traveling at 65 miles an hour (the posted speed limit) when a high school girl pulled out right in front of me to turn left. I was able to slow down some, but had other people in the other lanes so I hit her. I had two of my kids with me. No one was seriously hurt. Had I T-boned her it would ahve been entirely different. We know the girl that hit me--she is one of my hubby's students and was the wrestling manager for my son's team. I am very sore--back and neck. My car may be a gonner--it is not drivable and may get totaled out because it will cost more than it is worth. It is a 12 year old van, but has been very reliable. We trust God will know what is best for us. Thanks for you patience. Hey, happy day--long time no talk. It feels that way. Yesterday was my oldest baby's birthday--he turned 15 (which I might have already said he was 15 because I have thought of him that way for a few months--since he started the driver's ed thing!). We had to go out for Mexican food since he is my Cinco de Mayo baby. He brought his friend along. It was a fairly quiet night. I only do birthday parties on even birthday years for my kids. Not that he wanted pin the tail on the donkey, but I suppose I will do a sweet 16 party next year, maybe bowling or bunco. It is weird to have a kid that is 15 and one in kindergarten. It either keeps me young or makes me old very quickly--it depends on the day. The next quickie is a bulletin board. I painted an empty frame a got at a yard sale, cut a bulletin board that I bought at a thrift store down and covered it with a quilted sham I got for 50 cents at a thrift store. I slapped some coordinating paint on the frame first. I secured the sham with a staple gun. I will glue some buttons on tacks to match, but didn't get to that yet. 1. I had poker straight hair as a child and got perms to make it curly. After having babies, my hair became curly and now, most days, I use a flat iron to straighten it. Hmm-go figure! 2. My real name is just Becky. My parents figured everyone would call me that anyways, so they decided to just to name me that. However, as a child, most people called me Rebecca. 3. While we are on the name subject, I wanted to be Heather and my second grade teacher let me call myself that. 4. I have to watch news for at least five minutes before I get out of bed. I never used to be that way, only since 9/11. 5. I worked in Glacier Park and would purposely try to find grizzly bears ( I was often successful too). 6. I cannot or will not put cold syrup on pancakes. The restaurants love me! 7. I have an amazing memory of my childhood--it drives my siblings crazy. I can remember conversations and I can walk through places and houses that I was only in once or twice. I remember where my furniture was placed and the exact layout of my first home that I moved from at the age of 3 and a half. Here it is--project 7-- I made it through my quest. I learned some things along the way: I have plenty of junk on hand to make a variety of projects, most projects take at least an hour longer than I plan, I have junk ADD-it is hard for me to focus on just one project at a time, but if I just set a goal for myself I can accomplish a lot and it really helps me to complete one project before starting another. Project seven was done earlier this afternoon, but I sneaked off for a little girl time--chips and salsa and the Made Of Honor movie (it is cute and it aint the worse thing in the world having to look at Patrick Dempsy for a couple of hours Ü). 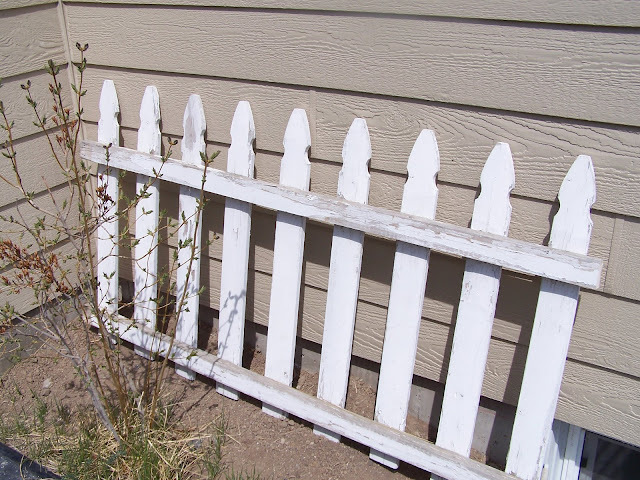 Project number seven is a couple of projects using a favorite of mine--picket fence. I took the pickets off and hammered out the nails. I cut the pickets down and gave them a light sanding. I kept the end pieces to make a few quick signs. I used the rail board from the fence to make a box for the table. I used cedar fence pieces for the top. They need to be sanded too because they are pretty rough. I used my favorite colors from the week and added the picket legs. 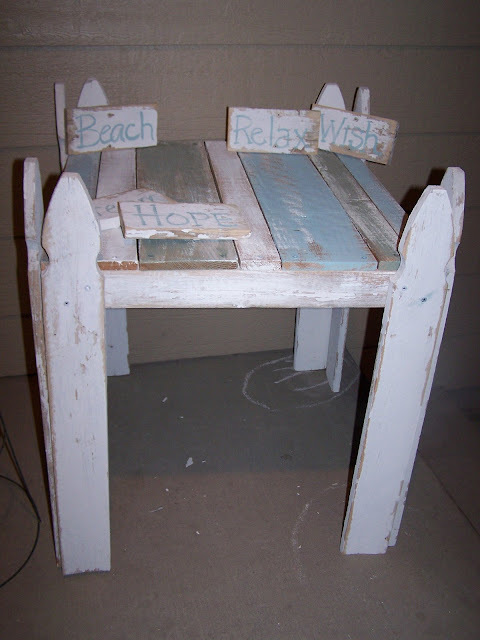 I think it would make a great porch table or deck table. 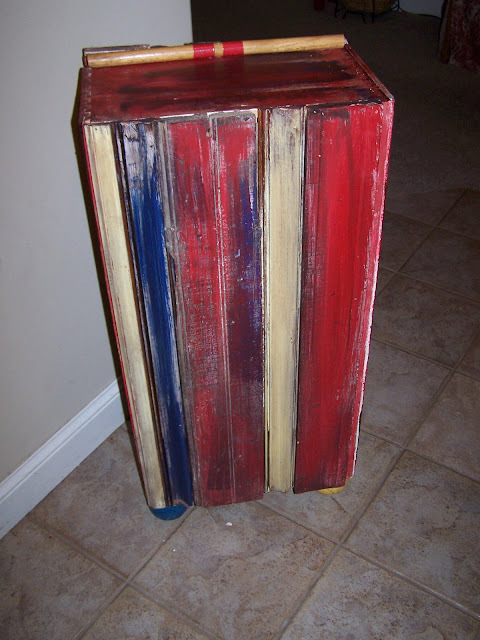 For the second project I made a planter out of--drum roll please--a planter. I know--how extremely creative. 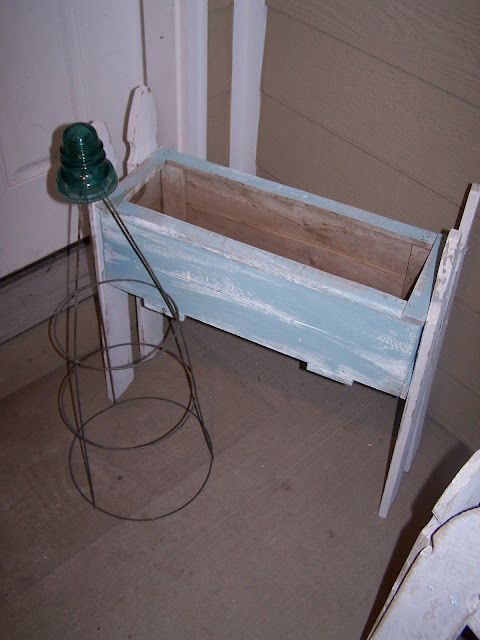 I did make the planter, which I pulled out of the neighbor's trash, better by painting it that beachy blue and adding picket legs to it. I also made a topiary from a tomato cage and an insulator that I will put in a pot with vines. I wired the top of the tomato cage together and then used some epoxy to glue it on. I turned it upside down, or right side up as it was originally intended while the glue dried so that it didn't drip. I saw a similar idea somewhere, but I am sorry I can't remember where. So there you have it--but wait, I have challenged myself again. 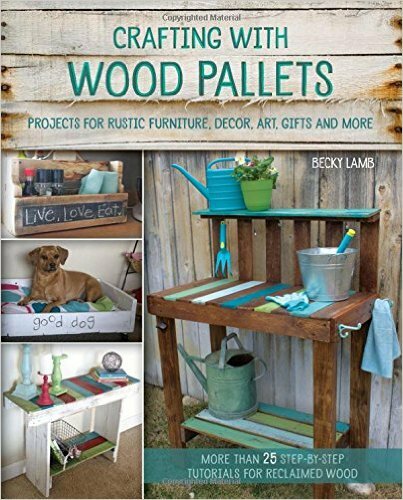 But before you get too excited or have me committed, this week I plan on making 7 more projects, but little, smaller, accessory style projects, not furniture. 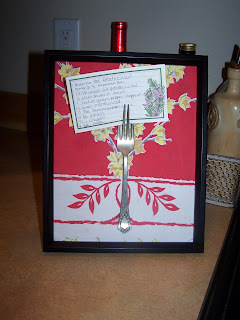 I may not post every day, but I will at least every other, so check back to see some quick ideas! Have a happy Monday. First of all--let me say to anyone and everyone who has been in the path of these tornadoes this week, my prayers are with you. I complain and whine about the cold weather, but it is nothing compared to the destruction these tornadoes have left. I just couldn't imagine seeing your house in matchstick pieces. Know that no matter what, God is good and He can create good from bad. I had to share some of my garage sale finds. I got some deals. See that brand new Liz Claiborne purse? $1, yes only $1. I spent $17.50 on all of this. See the cards on the cake plate (BTW--the cake plate is a joke gift for a friend, who will love it), I got a package of about 50 of those. What about that great watercolor that is signed and dated 1961? And those amazing hinges? 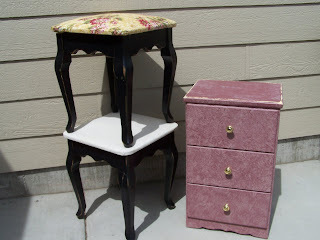 Now check out these stools and this little night stand I got for free. Yes, I said FREE! The little night stand is solid too. Onto the project of the day. Here is project six inspired by Margo, aka Robolady. 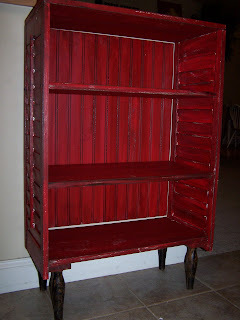 She does some amazing things with shutters. I think she could build a house entirely from shutters. Check her out at http://robolady.blogspot.com/. I forgot to take a before picture, but I did take this picture during the assembly process. Someone on HGTV boards asked the board one time who helps you assemble things. You sometimes have to get creative. A great set of clamps helps too! Pretty basic assembly. 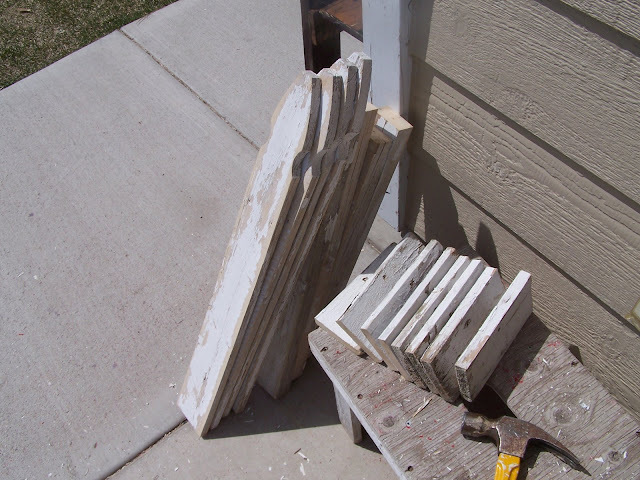 The shelf boards are just miscellaneous pieces of wood that worked ( I did have to cut them to size.) There are a few oops with this project. Notice the bead board backing does not fit. I cut it too small and will need to buy more to replace it. I also did a rather big oops that I decided will be a design element--I put the shutter rungs facing opposite directions on each side. One faces up and one down. I really think it will take someone a while to even notice this. The legs came from the bundle I bought today. I still need to put a trim piece along the front edge--I am looking for the right one. 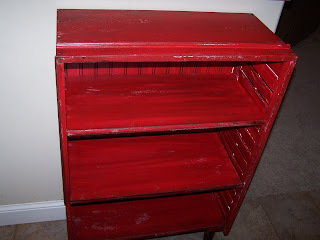 I still need to touch up the screw heads--I used every bit of red paint. All in all, I am pleased with this. It was fairly easy and not too time consuming. Tune into tomorrow for the last project in my quest. I would like to say I am going out with a bang, but I think it will be more of a "gentle" ending, i.e. not too exciting as I have a full day tomorrow. But still, come take a peek Ü. The rhymes are getting worse and this project was the most challenging for me. I am not sure why--it took the longest. Of course chatting with all of the neighbors walking by (and it was only 43 degrees--so why so many people were out I do not know!) did not help the time factor either. 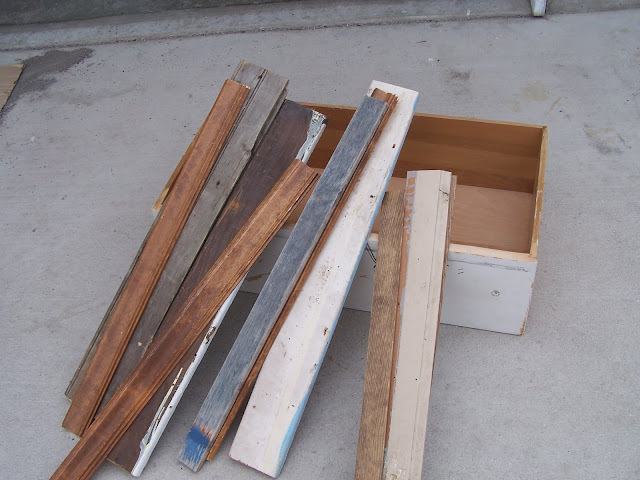 I started with the second drawer that I found roadside and some various trim boards. I had fun picking out the boards, but none of mine had cool colors, so I had to fake that. 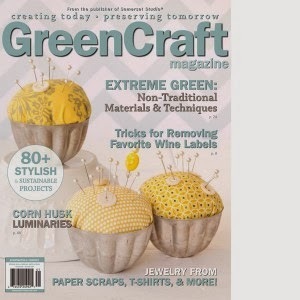 My color inspiration came from some old croquet balls I wanted to use as feet. I slapped paint on the boards and then some stain. I made shelves and painted those up to. I made a frame to attach the boards to for the door. I really enjoyed the piecing of the trim boards. I swear the croquet balls were made of cement--they were so hard to drill through! A little hint--I hot glue things, like the croquet ball feet, just to secure them for when I screw them in. Hot glue dries so fast and works well for this purpose. I added the pointy croquet marker thingy for a a handle and a piece of the croquet mallet across the top. I think I will finish trimming out the top with mallet sticks, but I have to look at it for awhile. I did need hubby's help tonight getting the hinges on--I just couldn't use my forehead this time--and I had to wait for him to get home from pulling sprinkler pipe. I still need to get a hook to secure the door. Here is the back of the cabinet. I used trim boards on it also to cover the bottom of the drawer. I am off in the morning to garage sales and then to work on another project. Hope you all have a great weekend--and keep checking back for the last two projects. I told you this one would be later. Thursdays are mom's taxi days--take one to dance, pick up one from dance, take one to soccer, take one to driver's ed., pick up from soccer, pick up from driver's ed. Plus Thursdays are my busy preschool day. But, I got 'er done and even before it is midnight on the east coast. 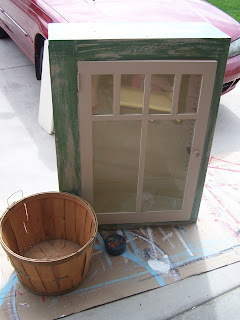 I started with an old barn type of door that I got out of a ditch and a free ladder from a homemade swing set. I cut the ladder down, added a two by four across the top of the ladder to secure it and screwed it to the barn door. 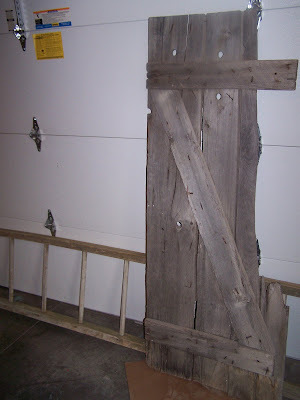 As you can see in the picture, part of the barn door was missing, so I had to saw some of it off. 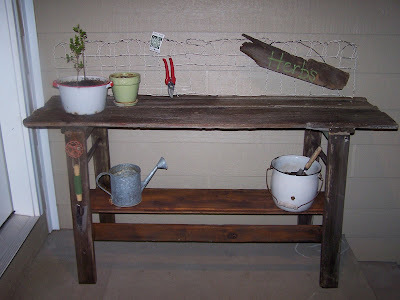 I then added some board along the bottom part to steady the potting bench and another board across the rungs for a shelf. 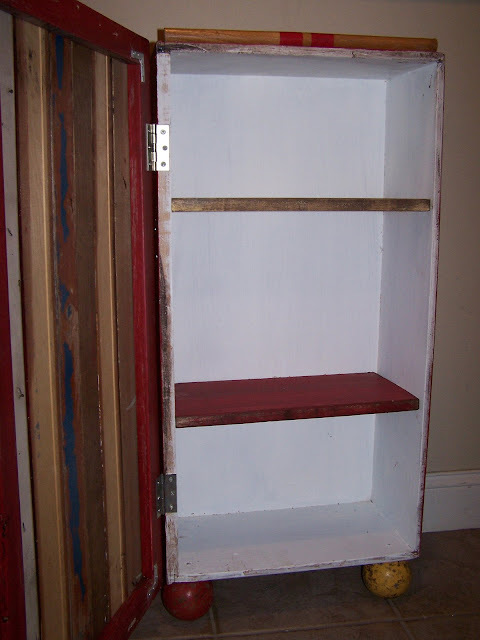 My original plan was to add a window frame to the back and put hooks on it, but all of mine were too big. Instead I used the wire garden fencing again. I clipped off some of the bottom wires, drilled holes through the table and put the remaining wires through the holes and secured them on the bottom. I added a faucet handle for a hook and will add another one when I find my box of them (Margo, have you seen them? Ü). I painted the herb sign on the part of the door I had to take off. I think I might still need to play with the paint treatment on the shelf and ladder, but I want to see it in the sunlight. I poly-urethaned the top. Oh and I curled up a few of the wire parts on the fencing to use as hooks too. Hopefully tomorrow's project will be completed earlier. Have a happy Friday!